U.S. gold and silver prices closed lower Friday but previous daily pick-ups combined to snap four-week losing streaks as gold advanced 0.8 percent and silver gained 3.0 percent. Gold was pressured Friday, said analysts, as investors sold the yellow metal to meet margin calls. Gold prices declined $17.40, or 1.1 percent, to settle at $1,635.80 an ounce in the December futures contract on the Comex in New York. Prices ranged from an intraday low of $1,627.60 to a high of $1,668.00. "When people need money to answer margin calls, gold is susceptible to liquidity bids from other markets. I don’t know if we have seen the bottom put in for gold after this week’s reversal," Reuters quoted Jeffrey Sherman, commodities portfolio manager at DoubleLine Capital, which oversees $17 billion in assets. 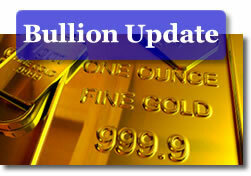 Forecasts are for higher gold prices next week, according to the weekly gold survey conducted by Kitco News. "Gold prices could see a bounce next week, the majority of participants in Kitco News’ Gold Survey said, although they give different reasons why the yellow metal could strengthen. In the Kitco News Gold Survey, out of 34 participants, 23 responded this week. Of those 23 participants, 16 see prices up, while three see prices down and four see prices sideways or unchanged. Market participants include bullion dealers, investment banks, futures traders and technical-chart analysts. The European situation is the main influence for gold’s direction for most of the market participants, whether they see higher or lower prices. Some of those who see stronger values next week cited…"
The best performing precious metal this year, gold has gained $214.40, or 15.1 percent, in 2011. Silver prices for December delivery dropped $1.012, or 3.2 percent, to $30.993 an ounce. Prices ranged from $30.710 to $32.850. "Gold, and silver to a much lesser extent, are viewed as safe havens and a store of value as well as the closest thing to a global reserve currency," Morgan Stanley analyst Hussein Allidina wrote in a report cited on Bloomberg. The bank raised its 2012 gold forecast by 35 percent to $2,200. "Gold and silver are our top commodity picks heading into 2012." Silver had easily led precious metals for most of the year until prices plunged nearly $11 in the third week of September. Silver’s 91.0 cent increase this week did bring it back into the black for the year, but just barely at 5.6 cents, or 0.2 percent. PGM’s tracked gold and silver on Friday but diverged for the week. Platinum prices for January delivery fell $14.80, or 1.0 percent, to $1,493.30 an ounce, moving between $1,486.60 and $1,544.30. Platinum declined $30.30, or 2.0 percent, this week. Palladium prices for December delivery lost $12.95, or 2.2 percent, to settle at $585.85 an ounce, trading from $584.10 to $619.00. Palladium fell $28.70, or 4.4 percent, this week. Platinum-group metals are not catching a break in 2011. Platinum has dived $284.90, or 16.0 percent, and palladium has plummeted $217.65, or 27.1 percent. Metals were mixed for the week. Gold, silver and platinum advanced with respective increases of 2.0, 5.0 and 1.2 percent. Palladium declined 0.8 percent. Bullion American Silver Eagles coins continue their impressive run. The .999 fine silver coins advanced another 400,000 on Friday, according to published sales figures from the U.S. Mint. That lifted their weekly total to over 1.66 million, which is one of the best weeks of the year — although bland against their previous weekly increase of 2.16 million. Demand has been exceptionally strong for Silver Eagles ever since silver prices dropped from around $40 an ounce toward $30 an ounce. On Thursday, the coins shattered the old annual record set in 2010 when year-to-date sales reached 34,673,500. (Read American Silver Eagle Bullion Coins Shatter Annual Sales Record). With Friday’s addition, Silver Eagles have now topped 35 million for the year. *The as of date for U.S. Mint sales of its America the Beautiful 5-ounce Silver Bullion Coins is Monday, October 3, 2011. The Mint does not publish daily sales levels for its 5-ounce coins. In U.S. Mint collector coin news, the bureau on Friday resumed sales of Silver Eagles and ATB 5 oz. coins. The numismatic coins had been suspended for re-pricing. The proof and uncirculated Silver Eagles had their prices cut by $9.50 while the 5-ounce silver uncirculated coins were each reduced in price by $50.